Not sure what to play this New Year? 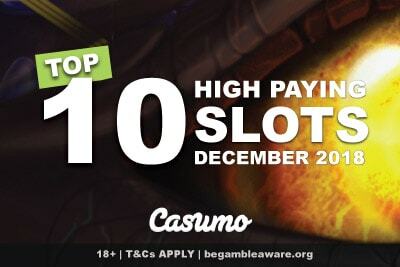 Casumo casino has released a fun look at the top slots that paid out the most in December 2018. The best way to know where you are going is to look where you’ve been. Or where other people have been. Because Casumo mobile casino isn’t afraid to show you which games are paying out the biggest amount and the most times to their players. They know, and we know, that it’s all down to the luck of the day. So don’t go into this list thinking these are ‘hot slots’ or slots that will definitely pay out big. There is no such thing. Just lady luck flicking her fingers randomly into the soup of the life. What can we say? We’re not very good at metaphors, but we are good at giving you stats, facts, and lists. What are the top 10 slots to win big this month? Some of these games won’t surprise you if you read our last top big win slots of the month. 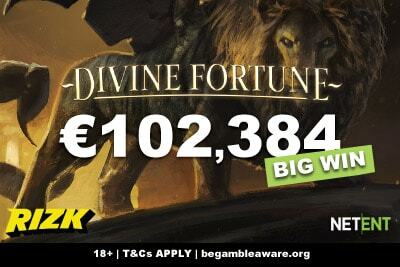 Because clearly long term Casumo casino players have favourites, and people keep reading these posts and just playing on these slots… and then it becomes a self-fulfilling prophecy. But these are the casino slots that pay out the most 2,000 times your bet wins in the month of December at Casumo. Next to the name, we’ve written how many of these wins triggered, but of course, we don’t know how many players spun, so it’s hard to look at the odds. The king of Play’n GO slots is at the top of the list again, no doubt because you can win as much as 5,000 times your bet, BUT because it’s become such a popular fruit machine. With an ancient Egyptian theme, 10 paylines, and wilds that act like scatters, this Book of Dead slot isn’t crazy complicated, but it’s fun. Watch the scatter pay symbols expand over the reels during the free spins and tell us this isn’t a game you should play every month, at least once. Does this NetEntertainment casino game need an introduction? NetEnt’s Dead or Alive slot has been going on for years and is usually buried deep within the casino game list so you have to know about it, to find it. Because it might be an incredibly volatile slot machine, but when it pays out, it pays out BIG. It’s another very traditional game, with 5 reels, 9 paylines, wilds, scatters and free spins. But during the bonus game, you get a 2x multiplier and sticky wilds, which can be a thrilling experience. Ok. So. This is a hard one to see on the list because if we are honest we did not like this game. Our Battleship Direct Hit slot review only has two stars because, honestly, we didn’t have that much fun playing it. We admitted that it has some really big wins hiding within the game. It’s a Megaway slot with 117,649 Ways to Win and four in-game jackpots. One of those jackpots is 5,000 in cash, meaning if it triggers often enough and you are betting 0.10 a spin… you can get all those big wins. This has been one of our very first favourite games from since we first started writing slot reviews for Lucky Mobile Slots. We gave it 5 stars, and we would still give it 5 stars, even if we haven’t had a chance to play it as often as we use to. Hey, we have to try dozens of new slots every month, we can’t return to all the favourites all that often. Yes, it’s super volatile, but 300 Shields slot has a 300x multiplier… and not many games can boast those numbers. This has given us, and hopefully you, an extra incentive to give this NextGen game a go. We didn’t expect to see this one here and for good reasons. Knight’s Life slot by Merkur has 5 paylines, 5 reels, full of very generic and boring Medieval symbols. You get a wild, you get a scatter and you get free spins. But during the free spins, you get progressively more wild symbols and bigger multipliers. That’s why Merkur (thought Edict Gaming) may not be pretty, but they usually pay well. By Red Tiger Gaming, The Dragons Fire slot is one of our highlights of 2018. Why? because you can win as much as 10,000 times your bet, as every consecutive win increases the multipliers on the right of the reels. It’s an easy feature, but one that really heats up the tension, especially as during the free spins, these multipliers don’t reset on a loss. So they just keep on climbing. Ok, we are starting to think that maybe we might be a little biased against Megaways slot machines. But we really liked Bonanza game and didn’t mind Vikings Unleashed slot. Why are we mentioning this? Mostly because we also gave this Slots O’ Gold slot a 2-star review, much like Battleship. But the thing you have to remember about Megaways games is that they all (mostly) have the potential to pay out big. This was another new release, which means people tried it and won. There’s a pattern here. We get it. This is this 17649 ways to win slot machine on our list, but this time we gave it 3 stars! Huzzah! And the reason we only gave the Who Wants To Be A Millionaire slot 3 stars is because we found the theme a little generic and a little millennial. Big Time Gaming makes it on the list again, this time with their fun crazy Mexican music themed game: the Danger High Voltage slot. 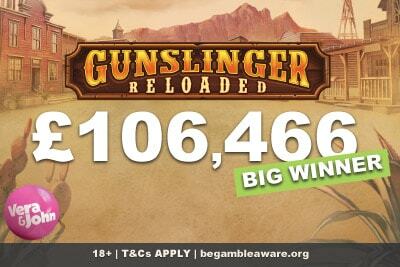 This mobile game didn’t just pay out big 6 times, but one of those times was a huge 11,027 times the bet. 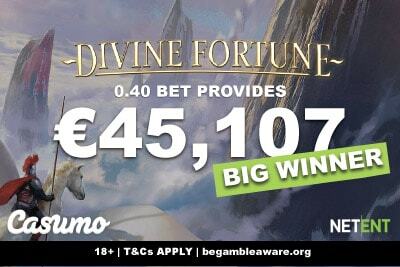 One lucky player won €4,410.86 from just a 0.40 spin in December, at Casumo. With 4096 Ways to Win, free spins, expanding wilds, multipliers, sticky wilds, there’s so much to get into here, the best thing to do it just to open up and play. What do you need to know about this game? Here’s a little rhyme to help explain it all. “Fat Santa is on his way, so keep your eyes peeled for his sleigh! He can’t get enough of the Christmas Pies, even as he soars through the skies. If you can feed him, prepare to cheer; the massive wins are almost here! Bigger and bigger he will grow! How big you ask? We don’t know! It’s time to celebrate and shout! No? Still no clue? Then read our Fat Santa slot review! We know it’s well past Christmas, but trust us when we say that this fun, unique game, gives you lots to smile about throughout the year.